Our master suite remodel is moving right along. Today, I thought I'd share our "before" bedroom and a bit of progress in this room. 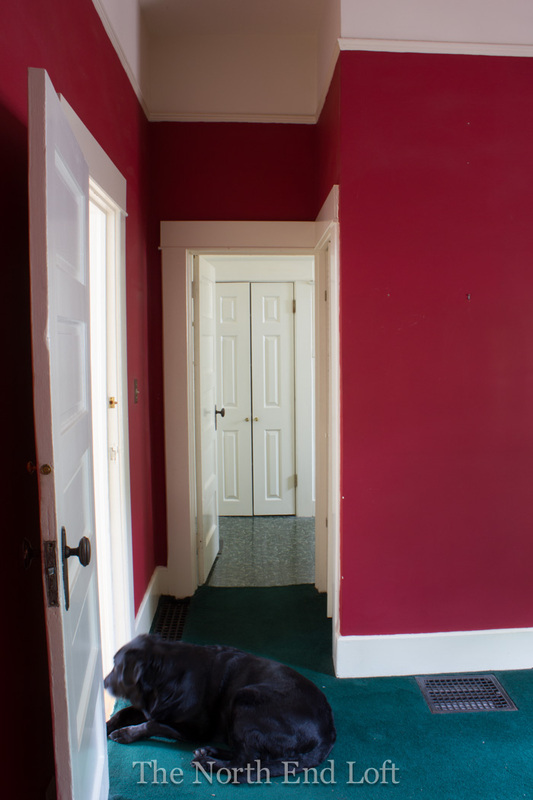 As you can see, our master bedroom had deep red walls with hunter green carpet. We were going for the cozy cocoon look, and this was one of my favorite rooms for years. The door with the mirror on it leads to a very small walk-in closet. Hey, these colors really were "in" once upon a time! Really! Very popular! Tucker is guarding the little hallway that leads to the master bathroom. 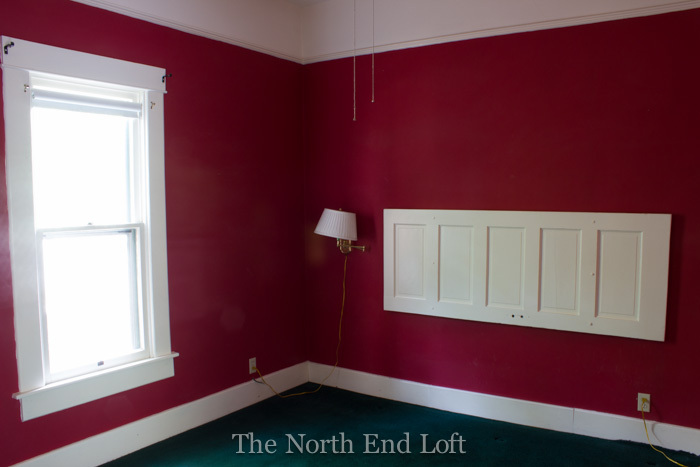 My favorite things in this room are the wide moldings, the high ceiling, and the picture rail. 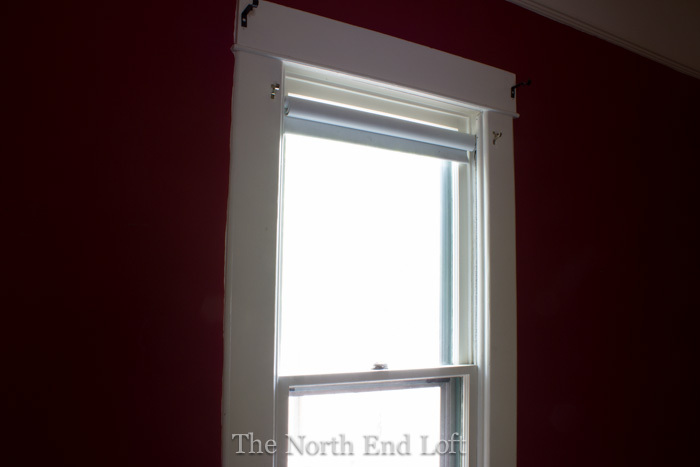 My least favorite things are the small size, about twelve feet square, and the lack of natural light from the one small window. But it is very cozy. 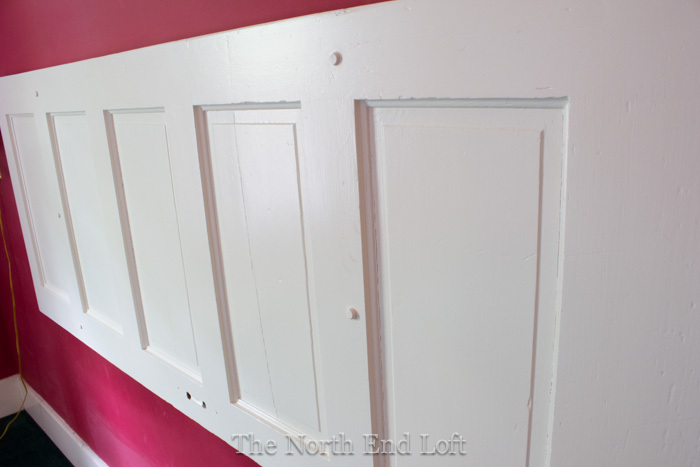 We bolted this great old five panel door to the wall for a headboard years ago, well before the days of DIY blogs with terrific illustrated tutorials for making proper headboards. 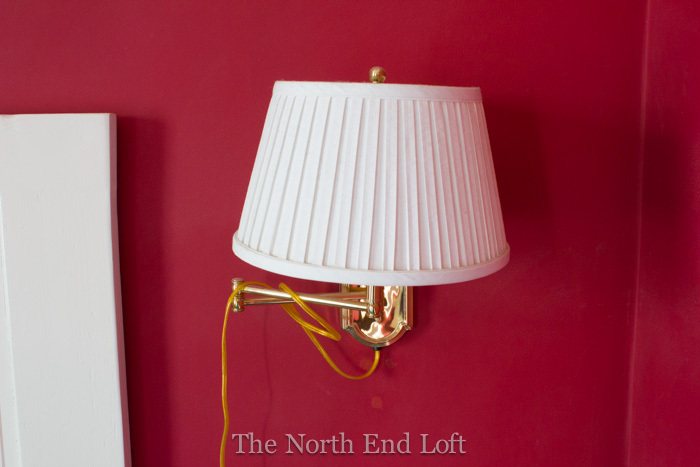 Out went the old headboard along with these inexpensive old brass bedside lamps that tilted off-kilter whenever we extended them for bedtime reading. And out, out, out went the old hunter green carpet! Past owners of our house must have really fallen in love with the stuff because so far we've uncovered it in the kitchen, in the formal dining room, and now here in the master bedroom; three very different vibrant patterns in each room. Isn't this wild? Everything came to a halt as a small piece of the linoleum was sent to a lab for asbestos testing. Had it contained asbestos, we would have just covered it up with new carpet rather than pay for expensive required containment and removal. Not only did we luck out when no asbestos was found, but the linoleum had never even been glued down to the floor. So there was no awful glue and felt backing to scrape off, just a few nails holding it down around the edges. It came off in minutes! 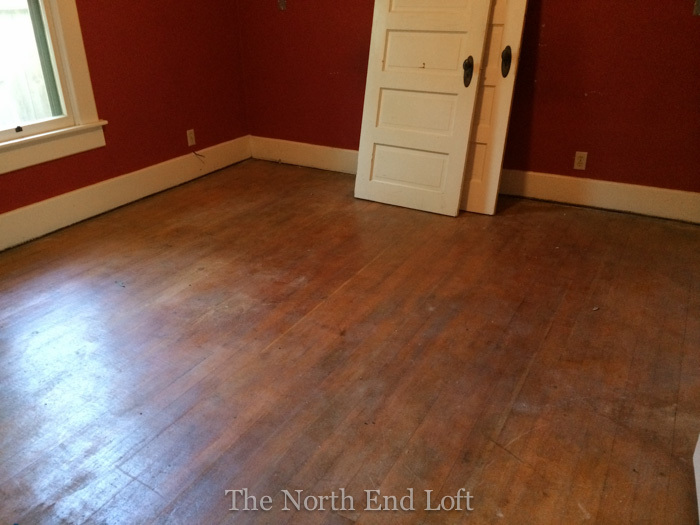 And luck stayed with us as the last of the linoleum was pulled up and we found the original fir floors in great shape for refinishing. I can tell you, we did a happy dance on these floors! Only a few small spots needed repairs. 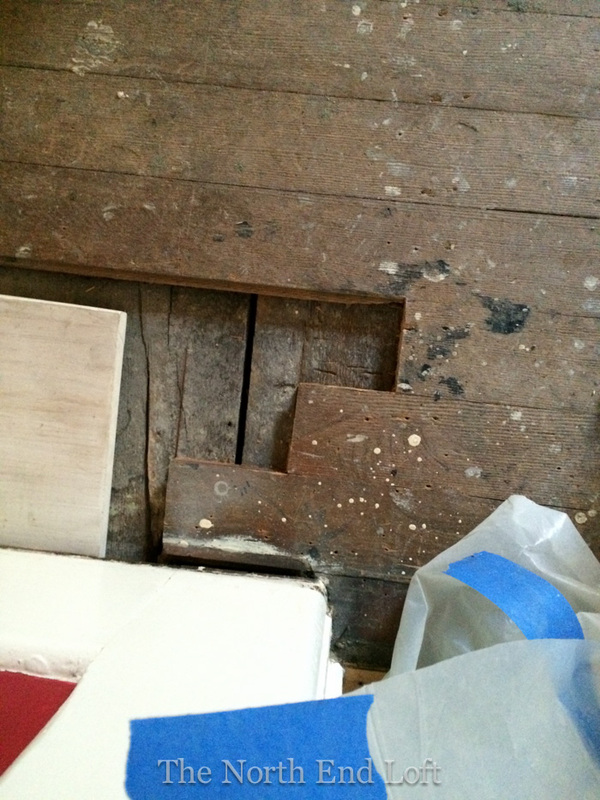 Here you can see the original subfloor under the nice thick Douglas fir boards. 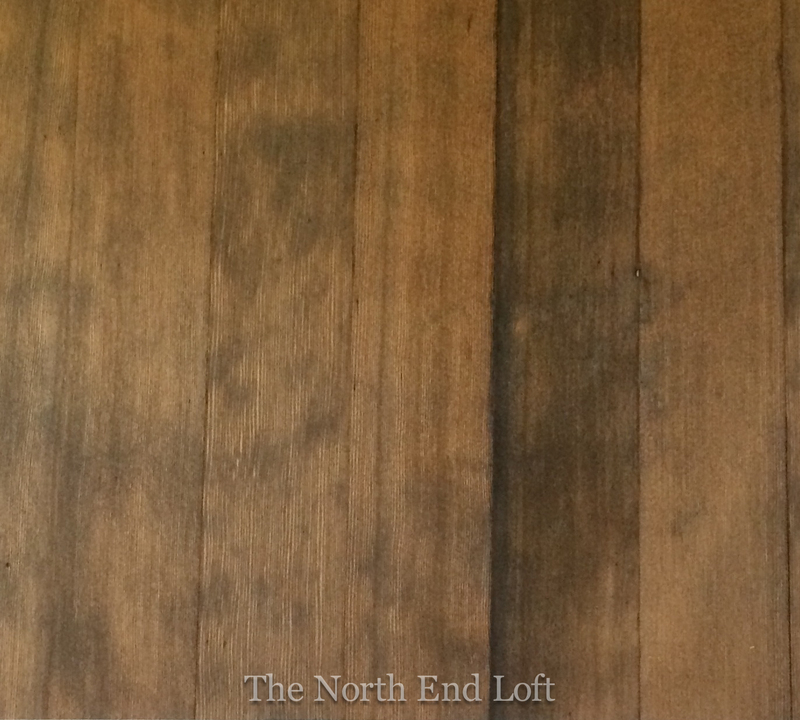 The floor refinishers put a few test patches of stain on the newly sanded floor for us today, and this Special Walnut is the one we chose. The men thought we'd be disappointed with the deep nicks and discolorations of 100 years gone by on our floor, and we said, "Oh no! That's our favorite part and what we like best!" I quickly snapped this blurry phone photo of the square they'd sanded and stained right before we cleared out so they can finish their work. The house will have to stay closed up tight for a couple of days while they work their magic, so we'll be staying in a nearby hotel. Thank you for stopping in to see what's going on with our master suite remodel today. I won't be showing anymore progress photos because it's so much more fun to see a big reveal at the end of a remodel, isn't it? I promise you'll be the first to know when it's all done! What a find! I'm happy that someone in the past had the sense not to stick the linoleum to the wood! Wonderful! Wow, Laurel, you really lucked out with those wood floors underneath it all. You have to wonder why they covered them up with all that to begin with! 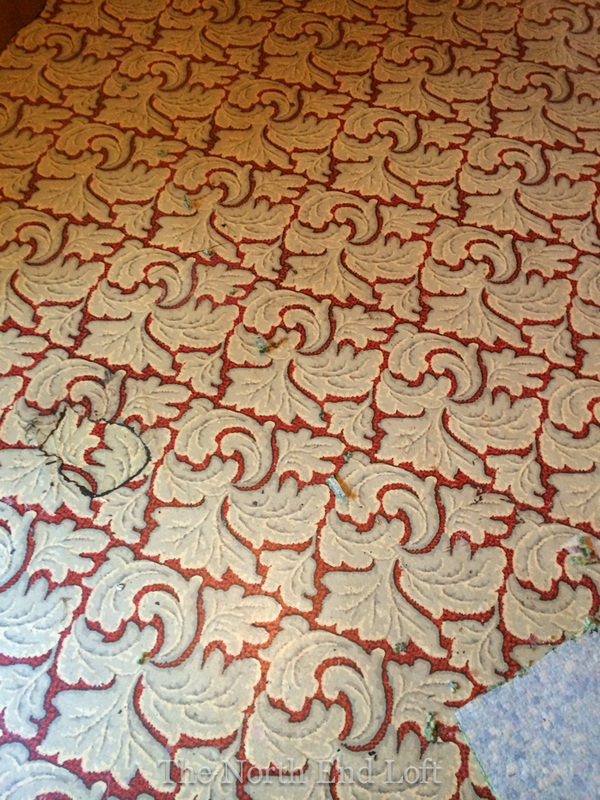 The carpet I could understand ~ I'm guessing for warmth in the winter months, but the linoleum I don't know. It is going to look great. I can't wait to see the big reveal! What beautiful wood floors ~ you usre hit the jackpot there! I eagerly await how they turn out! Linoleum is making a comeback, or so they say.....I still prefer wood floors. Have fun with this and can't wait to see it all completed. Those floors are nice and can't wait to see everything done. I remember going to the store with my Mom to buy linoleum for the kitchen and livingroom. Back then they put it everywhere. Your so lucky to have that beautiful hard wood floor underneath Laurel! Your on a roll, first the master bath now the master, can't wait to see it all done! I remember those colors well! 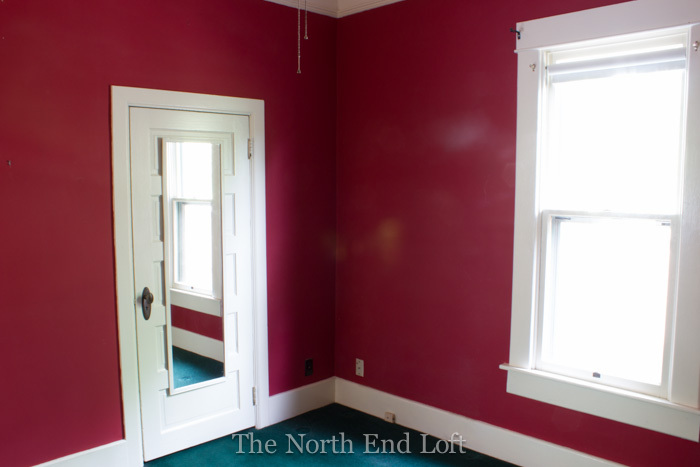 Our small bedroom in our previous house wore the same cranberry paint on the walls. Your floors are looking awesome, and you're so lucky you didn't have to spend days scraping that black yuck off! 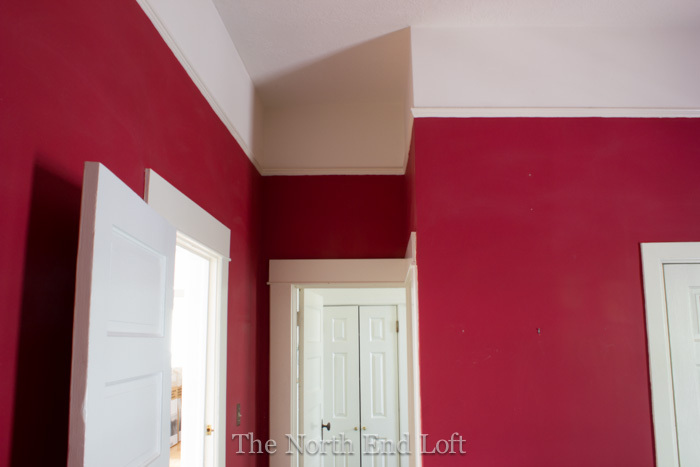 I love your tall ceilings and trim, too. I can't wait for the reveal! WOW! What a nice surprise to find those beautiful floors. I can't wait to see the reveal! Things are coming along wonderfully well! That old lino reminds me of some of the rug patterns that are popular today... But the fir floors are going to be fantastic! Oh the red, hunter green, navy color scheme ( only outdone by French blue and mauve!). :-) The old linoleum is something! Glad you lucked out of the asbestos! And to find such beautiful wood floor underneath! I'm jealous. :) can't wait to see your final reveal. I know it's going to be beautiful! The best treasures are the ones you find in your own home, when you suddenly find things you've forgotten about, and they just happen to fit into your current design scheme, like these original, wood floors, that will add such warmth and beauty to your new master bedroom, very cozy indeed! Being at the hotel is like a sort of mini getaway. Looking forward to seeing the reveal. Thanks for stopping by and your kind comment. I have always worked in a lamp in the bathroom. Love it and so nice when guests come. How wonderful to discover those beautiful wood floors! And thanks for keeping it real Laurel. 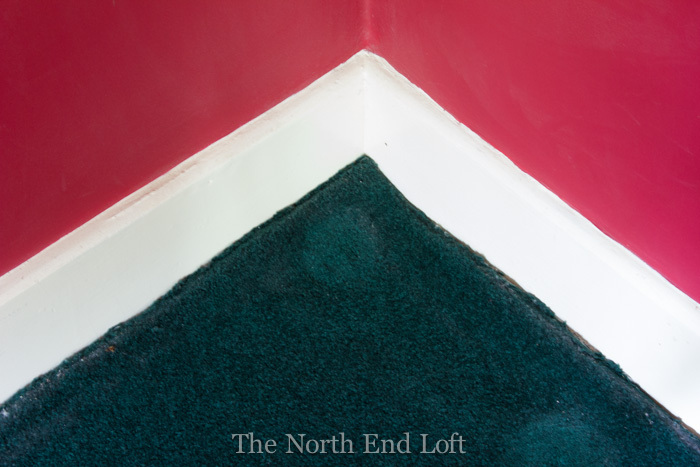 We can't all update our décor every five minutes and sometimes need to wait a good long time for an update. I think that just makes us appreciate it all the more! This is so exciting! And you're so lucky the dreaded linoleum came out so easily. Can't wait to see the final reveal!!! so excited for you Laurel, can't wait to see the reveal. Your floors are going to look so beautiful when they're done! 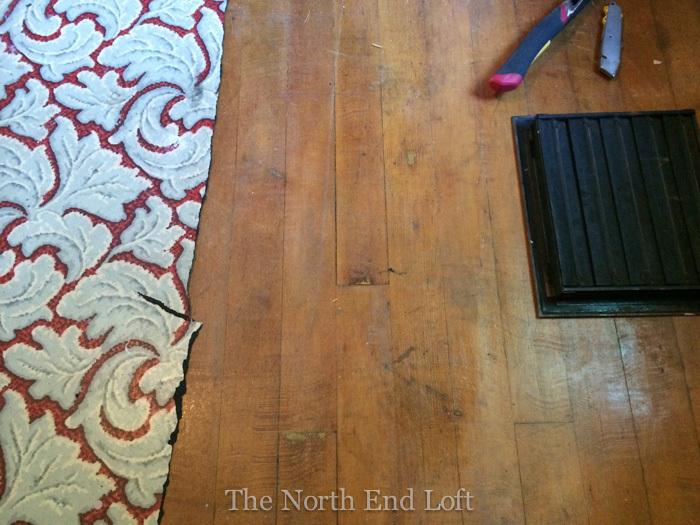 There's nothing better than hardwood floors - beats carpeting anytime. Laurel - what gorgeous floors - you guys hit the jackpot! I am on pins and needles waiting on the bathroom - so excited for you! 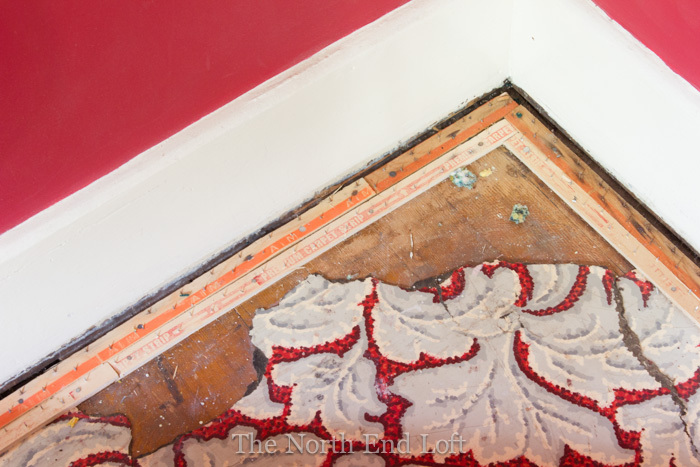 It's fun to see what was popular in the past - that linoleum is really something! How lucky to be able to pull it up easily and have wonderful floors underneath! 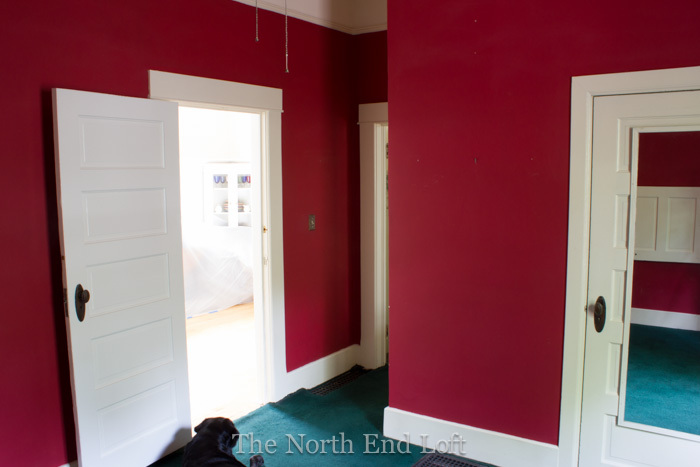 My dining room is a very similar shade of red and I'm ready to redo. I can't wait to see what you do with your room and what it takes to cover the walls!